Since Hurricane Sandy paid us a visit this week, knocked over some trees in our neighborhood here in the Philly suburbs, and took away our power from Monday night into Tuesday morning, we've been thinking a lot about her Caribbean origins. Her Caribbean origins made us think about coconut. 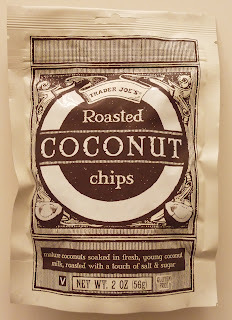 And our thoughts of coconut led to our purchase of a bag of Trader Joe's Roasted Coconut Chips. It's mature coconuts soaked in young coconut juice. The best of both worlds. No need to choose experience over youth or vice versa. I'm pretty sure young coconuts are greenish and old coconuts are brownish, but other than that, I don't think I could tell you much about them. 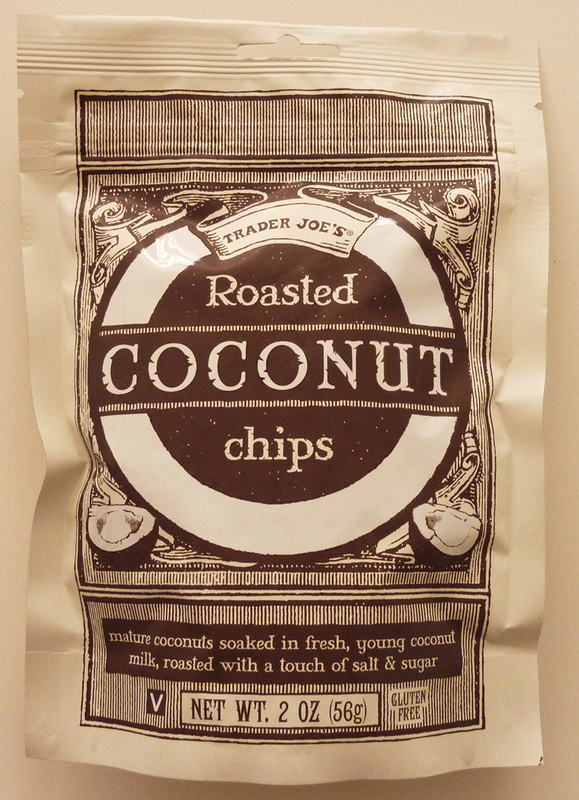 But I've always liked coconuts and coconut-flavored things, and this bag of snackaliciousness is no exception. They're satisfyingly sweet, and they're big enough to treat them like bite-size snack chips, yet small enough to use them as toppings on cakes, ice cream, pudding, or what have you. At $1.99 for a bag, I'd say they were a pretty good value. If you're a fan of coconut, go ahead and shell out the 2 bones for something that I think could very well find itself appearing regularly on your TJ's shopping list. They have a similar texture to that of the shredded coconut bits that we all know and love—the kind that are used as toppings on cakes and other desserts, but these "chips" have properties similar to other chips. They're flat and extremely crispy. They crunch when you eat them, and they have significantly more surface area than a bit of shredded coconut. Sonia gives them a score of 4 stars. She wishes the bag were larger, but other than that, she was quite pleased. I agree that in this case, more would have been better, but this relatively healthy snack was tasty enough to garner 4 and a half stars from me. I love your blog always... where in TJ's did you find these? Chip aisle? with the sweets? In the TJ's we bought these at (Center City Philadelphia) they were in the chip aisle, near the dried fruit snacks and nuts, Laura. 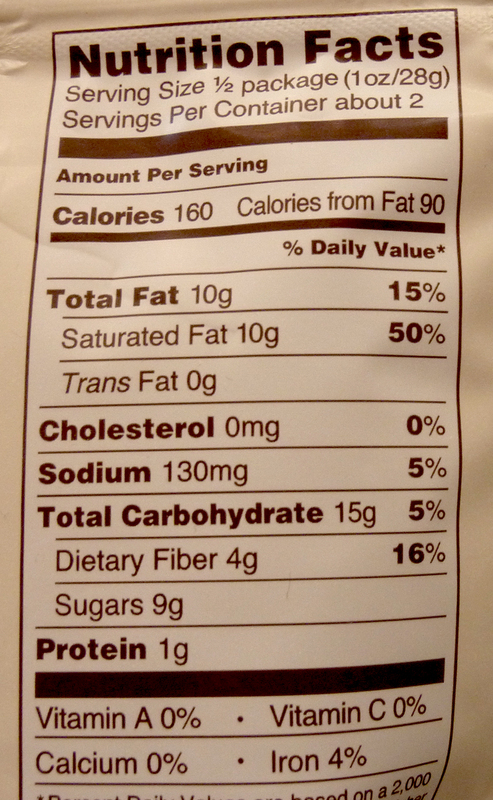 I don't think I would call a product with this much fat healthy....but for a treat I will check out my TJ's as soon as the power is back on her in RI. We have gone through a few bags of these now. I love the chips all on their own but they are fantastic on Greek yogurt parfaits too especially with the honey roasted almond slices. Mary, coconut is a very fat source. I love these, and their literally about 1/2 the price you would pay for coconut chips elsewhere. Saturated fat is good for you. It's the poly unsaturated and hydrogenated and all grain oils that are bad for you. No.. That is not true at all. Unsaturated fats are the fats that are good for you! 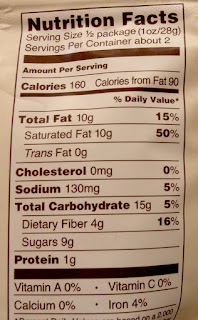 Trans fat is the one that is truly awful that comes from partially hydrogenated oils and the like. I spotted these on my last trip to Trader Joe's in Seattle and bought two bags having never tried them or read any reviews. Regrettably I only opened them when I arrived back home in Canada and wish I had bought a whole box of them. Drat! Super delish - I agree with your comments: Snackalicious! My mother is absolutely obsessed with these. Before TJs opened where she lives, I was forced to buy 10 at a time and mail them.